At Advanced Basement Systems, we specialize in crawl space repair of all types. If you're experiencing a structural problem with your crawl space, we have a solution for you. Call us today at 1-844-320-1542 or contact us online to learn more! We offer free estimates in London, Windsor, Chatham, Sarnia and surrounding areas. The SmartJack® from Advanced Basement Systems is the solution to these problems. SmartJack® crawl space support posts provide an effective, durable solution for leveling and stabilizing damaged crawl spaces. Unlike concrete blocks that will only sink further into the ground, the SmartJack® provides a permanent solution. Worried about the structural integrity of your crawl space? Look no further than the professionals at Advanced Basement Systems. As your local crawl space repair experts, we can evaluate your home and install durable SmartJacks™ to ensure your home has stable, level floors. Call us today at 1-844-320-1542 or contact us online to learn more about how we can repair all your crawl space problems. 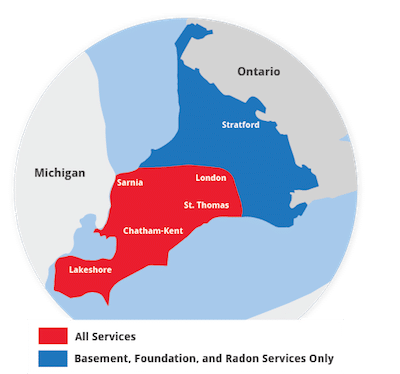 We offer free estimates on all our work in London, Windsor, Chatham, Sarnia, Windsor, Stratford, St Thomas, Leamington, Essex, Amherstburg, Strathroy and throughout the surrounding areas.